The 2018 St. Jude Walk/Run is one month from today and ESA has raised an incredible $22,021 so far, but we need your help to reach our goal. We are kicking off a month of weekly fundraising challenges to help us get there. 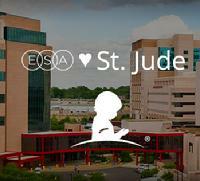 Watch your email for a new challenge and a chance to earn fun ESA for St. Jude Prizes! Register yourself and your friends for a walk in your area, your $10 registration counts as a donation toward our total! No walk near you? Register for the virtual walk and support from a distance through your own fundraising. Anyone who registers between 8/22 and 8/29 will be entered for a chance to win a pair of St. Jude headphones! Since opening 50 years ago, St. Jude Children’s Research Hospital has changed the way the world treats childhood cancer and other life-threatening diseases. No family ever pays St. Jude for the care their child receives and, for every child treated here, thousands more have been saved worldwide through St. Jude discoveries. The hospital has played a pivotal role in pushing U.S. pediatric cancer survival rates from 20 to 80 percent overall, and is the first and only National Cancer Institute-designated Comprehensive Cancer Center devoted to children. It is also a leader in the research and treatment of blood disorders and infectious diseases in children. St. Jude was founded by the late entertainer Danny Thomas, who believed that no child should die in the dawn of life. Join that mission by visiting stjude.org or following us on facebook.com/stjude and twitter.com/stjude.